This is a special opportunity for me to welcome you to the Department of Mechanical Engineering at SIUE. Here, we strive to provide excellent engineering education to our undergraduate and graduate students. Mechanical engineering is an exciting program where students learn to apply theory and gain valuable experience in the design and fabrication of innovative machines. Mechanical engineers have a major role in the design and maintenance of a variety of machines used every day. We can see many innovative products of mechanical engineering at work when flying in an aircraft, driving in a car, enjoying an air-conditioned room, sitting in a dentist's chair, or visiting the operating room of a hospital. Such innovations continue to significantly contribute to the improvement of the quality of human life. 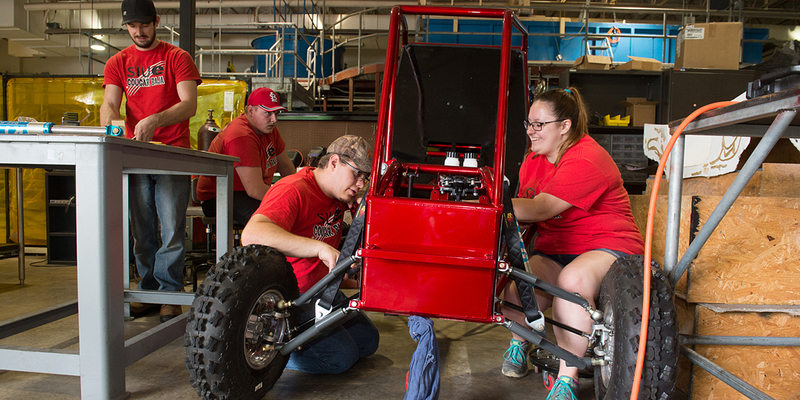 Mechanical engineering education at SIUE is a promising program among students. The high quality education, welcoming environment, close student-faculty interactions, as well as an optimum cost of attending SIUE have contributed to the reputation of our program. Over the past few years, enrollment in our department has steadily increased. With the many job opportunities available to mechanical engineers, our students are encouraged to strive for achieving excellence in their education; hence, better preparing themselves for an exciting and innovative career. Our program offers Bachelor of Science (BS) and Master of Science (MS) degrees in mechanical engineering, and a cooperative doctoral program offering a PhD in engineering science. In addition, we offer a combined BS/MS degree (3+2 program), which allows students a smooth transition into our graduate program to complete both a BS and MS degree in five years. The prominent faculty of our program come from diverse academic and research backgrounds. The major areas of expertise in our department consist of: control, design, dynamics, mechatronics, vibration, and thermal-fluid sciences. In addition to teaching, the mechanical engineering faculty are actively engaged in advanced research programs including: mechatronics and robotics, applied control, bioMEMS and microfluidic systems, energy and thermal systems, HVAC and refrigeration, solar energy and green roofs, micro/nano-fabrication for energy applications, multi-body dynamics, nonlinear vibration and structural dynamics, damage mechanics, polymer and fracture mechanics, impact dynamics, and automotive safety. The traditional mechanical engineering program requires an understanding of core principles of mechanics, coupled with a focused application to design/build/test opportunities in the senior year. Students take various courses in mathematics, physical sciences, engineering and general education, but the program emphasizes both theory and practice. The conventional lecture courses provide a strong theoretical background in physical and engineering sciences, while the laboratory practices and design/build/test projects are intended to give practical hands-on experience. In addition to the required curriculum, our students have opportunities to engage in numerous extracurricular activities, ranging from participating in different student organizations to actively working in various design and competition teams. Thank you for your interest in our program. We encourage you to visit our department during the annual Explore Day (open house) in November, to participate in the School of Engineering tour, and to speak with our faculty and students. We look forward to hearing from you and sincerely hope that you will decide to take part in our program.